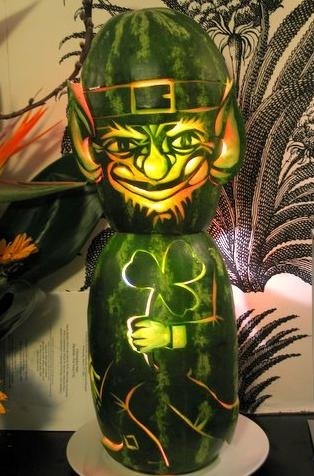 HOW TO AVOID GETTING PINCHED ON ST. PATRICK’S DAY - What About Watermelon? Remember when you were a kid and you had to wear green to school on St. Patrick’s Day to avoid being pinched? Surely, I’m not the only one who observed this painful tradition. Not surprisingly, now that I’m adult, I don’t give a hoot about wearing green on St. Patrick’s Day. The main reasons for that are that I don’t have many articles of green clothing, and adults usually don’t run around pinching each other. So how CAN you observe this great Irish holiday as an adult? Many folks like to grab a few green beers during happy hour. Others might prepare some corned beef and cabbage at home. You might also consider adding watermelon to your green-holiday menu. Sure, it’s not green on the inside, but it’s very green on the outside. And as long as you’re eating something that has green on it, maybe the leprechauns (and your co-workers) won’t pinch you. I too remember this tradition. Yes, I did where green on St. Patrick’s Day to avoid getting pinched. I never knew that! I do wear green anyway my heritage is Irish! Glad to hear that I’m not the only one who was paranoid about getting pinched!